Advertisement from Mackay Mercury, Tuesday, February 21, 1888. James Comerford was born in Kilkenny , Ireland in 1857. 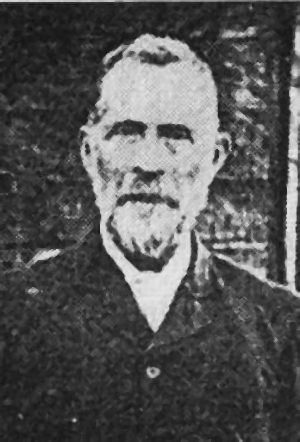 He arrived in Australia at Rockhampton in 1879 and ended up at the Mount Britton Gold Rush west of Mackay in 1881 and worked as a miner for 15 months before proceeding to Mackay. He then moved to Cooktown before returning and settling in Mackay in 1887. He purchased Edmund Barron's Cordial factory which was located in Gregory Street on a site now occupied by the St. Patrick's College. Edmund Barron started the business in 1869. At the time it was said he used a three horse power vertical engine to drive the cordial making and bottling machinery. He was said to have enjoyed considerable local patronage of his business. He married Margaret Griffin in 1888 and the couple eventually had a family of seven children. 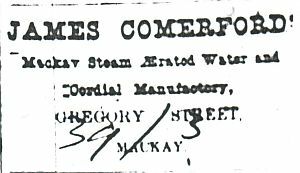 James Comerford was not in the Cordial manufacturing business long and moved to the Eungella goldfields in 1890 when the rush started. He was involved in several ventures whilst at Eungella. When the goldfield collapsed he engaged in timber getting in the Eungella Rainforest. The Comerfords were the second last family to leave the diggings in 1902. The family moved to Finch Hatton in 1903 when James purchased land for a farm in Wilson's Paddock. When the Cattle Creek Sugar Mill was established he was one of the founders of the mill being a provisional director. He was elected to the first board and held the position of director until he retired in 1912 due to ill health. James Comerford passed away on 30 January 1918 aged 61 years and was buried in the Roman Catholic portion of the Old Mackay Cemetery. Morrison, Frederic. W. ,(1888) ,Aldine History of Queensland , Sydney, N.S.W: Aldine Publishing Company. The Daily Mercury, Saturday, February, 2, 1918. The Daily Mercury, Friday, April 25, 2003.